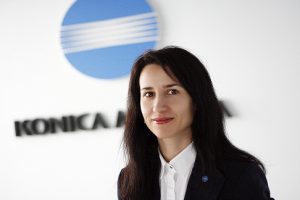 Konica Minolta Business Solution Bulgaria is part of Konica Minolta’s global net. The company offers innovative multifunctional devices and software applications and services that perfectly fit the individual needs for print and document workflow in the modern business environment. According to Swiss agency infoSource, Konica Minolta is a leader on the Bulgarian market for colour and black-and-white A3 printing devices in 2012. At present, Konica Minolta has offices in Sofia, Varna, Plovdiv and Stara Zagora. How do Konica Minolta’s solutions help businesses increase the productivity and efficiency of their operations? Konica Minolta provides a wide portfolio of solutions for improving the businesses’ productivity and efficiency by offering the right tools for optimisation and management of their printing environment and document management. And by solutions, we mean the comprehensive mix of hardware and software, from simple document capturing automation to optimisation of whole business processes and implementation of a thorough document management system. From our experience so far, we can see up to 30% cost improvement by simply implementing a solution that provides transparency of the printing process in the company and offers tools for speeding up employees’ daily operations like printing, scanning, and copying. Further statistics say that companies’ cost for invoice processing is 30 euro on average, as well as that employees spend about 150 hours annually looking for a document they cannot find as eventually 5% of the corporate documents are lost. All this could be solved by implementing an Enterprise Content Management system, which is a powerful tool for management of the whole document lifecycle in corporations. What solutions does Konica Minolta offer to clients eyeing a closed-cycle waste-free production process? At Konica Minolta, we have always attached top priority to our responsibility for the world we live in. This is why we have developed numerous proprietary Konica Minolta features and technologies to help minimise the impact that using our products has on the environment. This approach begins with the research and development of new products and services, continues through all internal processes integrating both the supplier and customer chain, and comes full circle with the recycling of old devices. Here are just some of our examples. Our Simitri HD polymerised toner has considerably less impact on the environment during its production, use and recycling. Konica Minolta adopted IH technology to design an energy- efficient fusing unit. Our latest product generation switches to energy-saving mode faster and consumes considerably less power in sleep mode than previous products. Which is your key product category pacing the company’s growth on the Bulgarian market? Those are our business solutions – we provide the products, systems and solutions that satisfy the demands of the office and production printing markets. According to Infosource, Konica Minolta is a market leader in three segments for 2012 – A3 colour devices, A3 B/W devices and colour production printing devices. Could you comment on the development of the overall printer market in Bulgaria? Across Eastern Europe, the printing devices market has dropped dramatically during the last five years, and Bulgaria is no exception to this trend. Unfortunately, market researchers do not forecast significant growth within the next few years. However, Konica Minolta Business Solutions Bulgaria has managed to maintain its leadership position. What is your view of the pace of recovery of IT spending in Bulgaria? Market researchers forecast less than 7% growth of IT spending in Bulgaria until 2017. Unlike the unstable hardware market, the outlook on Bulgaria’s software and services markets is for long-term growth. Expansion of the Konica Minolta software and services portfolio should bring additional value to our customers and could result in higher hardware sales as well.